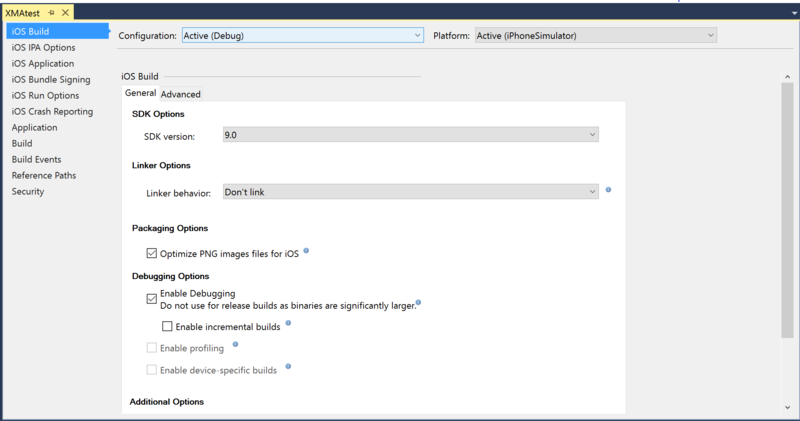 借助 Xamarin for Windows，iOS 应用程序可在 Visual Studio 中进行编写和测试，并且由联网的 Mac 提供生成和部署服务。Xamarin for Windows allows iOS applications to be written and tested within Visual Studio, with a networked Mac providing the build and deployment service. 本文介绍在每台计算机上安装和配置 Xamarin.iOS 工具以使用 Visual Studio 生成 iOS 应用程序的步骤。This article covers the steps to install and configure the Xamarin.iOS tools on each computer to build iOS applications using Visual Studio. 为 iOS、Android 和 Windows 应用程序创建跨平台解决方案。Creation of cross-platform solutions for iOS, Android and Windows applications. 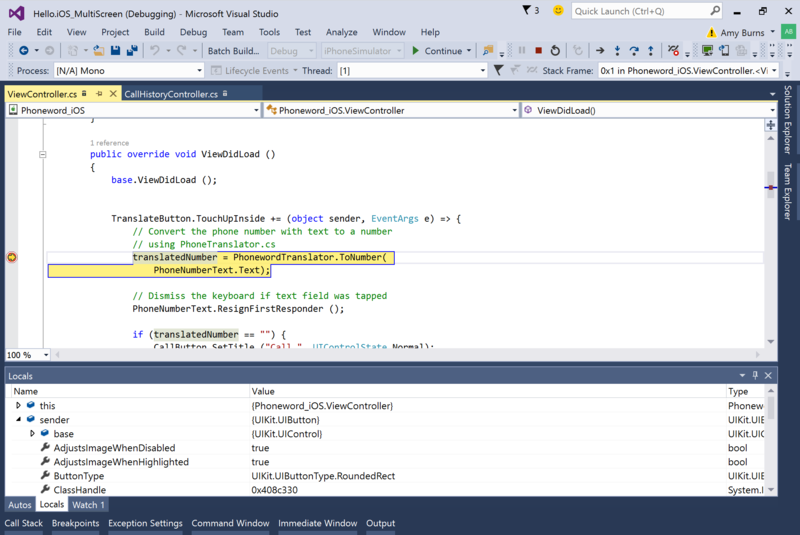 对所有跨平台项目（包括 iOS 源代码）使用常用 Visual Studio 工具（如 Resharper 和 Team Foundation Server）。Using your favorite Visual Studio tools (such as Resharper and Team Foundation Server) for all your cross-platform projects, including iOS source code. 使用熟悉的 IDE，同时利用所有 Apple API 的 Xamarin.iOS 绑定。Work with a familiar IDE, while taking advantage of Xamarin.iOS bindings of all Apple’s APIs. 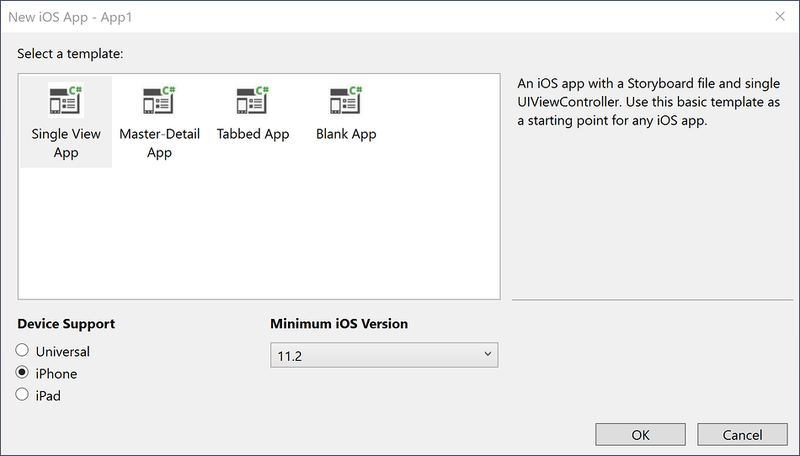 在 Visual Studio 中开发 iOS 时必须遵守一些要求。There are a few requirements that must be adhered to when developing for iOS in Visual Studio. 正如概述中简要提到，编译 IPA 文件需要 Mac，且应用程序不能部署到没有 Apple 证书和代码签名工具的设备上。As briefly mentioned in the overview, a Mac is required to compile IPA files, and applications cannot be deployed to a device without Apple’s certificates and code-signing tools. 使用 Mac 作为主要的开发计算机，并运行安装了 Visual Studio 的 Windows 虚拟机。Use a Mac as your main development machine and run a Windows virtual machine with Visual Studio installed. 建议使用 VM 软件，如 Parallels 或 VMWare。We recommend using VM software such as Parallels or VMWare . 将 Mac 当做生成主机使用。Use a Mac just as a build host. 在这种情况下，需连接到与 Windows 计算机所处的同一网络上，该计算机已安装必备工具。In this scenario it would be connected to the same network as a Windows machine with the necessary tools installed. 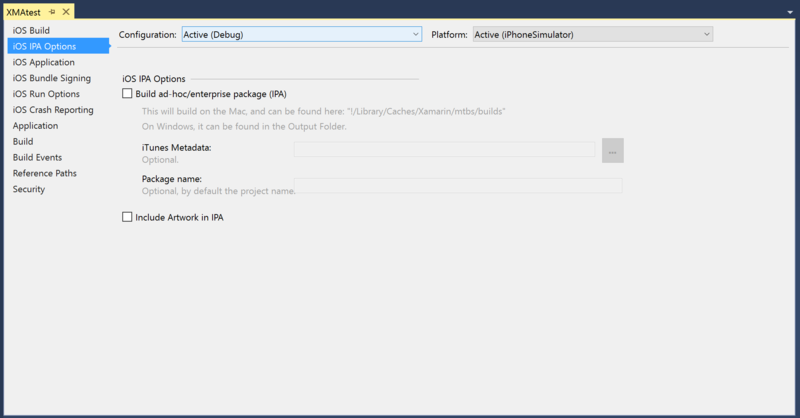 要将 Visual Studio 连接到 Mac 生成主机，请按照与 Mac 配对指南中的说明进行操作。To connect Visual Studio to your Mac build host, follow the instructions in the Pair to Mac guide. 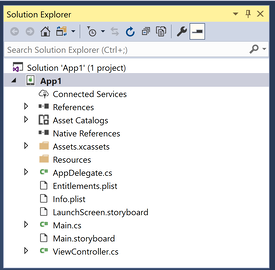 Xamarin iOS for Visual Studio 将项添加到标准工具栏和新的 iOS 工具栏。Xamarin iOS for Visual Studio adds items to the Standard toolbar and to the new iOS toolbar. 下面介绍了这些工具栏的功能。The functions of these toolbars are explained below. 开始 - 开始在选定平台上调试或运行应用。Start - Starts debugging or running the application on the selected platform. Mac 必须已连接（可查看 iOS 工具栏中的状态指示器）。There must be a connected Mac (see the status indicator in the iOS toolbar). 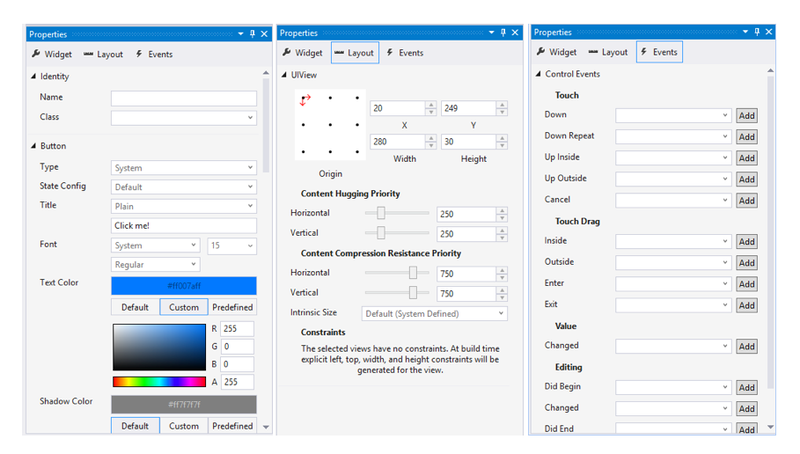 解决方案配置 - 允许选择要使用的配置（例如，调试和发布）。Solution Configurations – Allows you to select the configuration to use (e.g., Debug, Release). 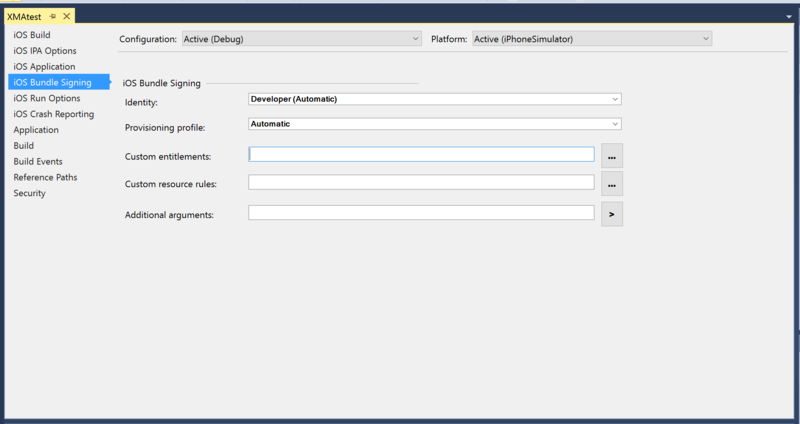 解决方案平台 - 可以选择“iPhone”或“iPhoneSimulator”进行部署。Solution Platforms - Allows you to select iPhone or iPhoneSimulator for deployment. Mac 代理/连接管理器 - 显示 Xamarin Mac 代理对话框。Mac Agent/Connection Manager – Displays the Xamarin Mac Agent dialog box. 正在连接时，此图标显示为橙色；已连接时，显示为绿色。This icon will appear orange when connecting, and green when connected. 显示 iOS 模拟器 - 在 Mac 上将 iOS 模拟器窗口放在最前面。Show iOS Simulator – Brings the iOS Simulator window to the front on the Mac. 显示生成服务器上的 IPA 文件 - 打开 Mac 上的 Finder，找到应用程序的 IPA 输出文件位置。Show IPA File on Build Server – Opens Finder on the Mac to the location of the application’s IPA output file. “输出”窗格具有多个选项，可以查看这些选项，发现有关生成、部署、连接消息和错误。There are options in the Output pane that you can view to discover build, deployment, and connection messages and errors. Xamarin - 此项包含仅与 Xamarin 相关的信息，如与 Mac 的连接情况和激活状态。Xamarin – This contains information relating solely to Xamarin, such as the connection to the Mac and activation status. 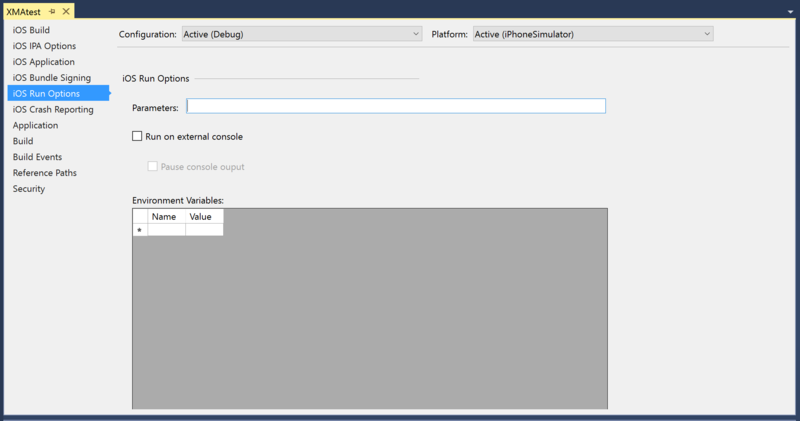 Xamarin 诊断 - 此窗格显示 Xamarin 项目的更多详细信息，如与 Android 的交互。Xamarin Diagnostics – This shows more detailed information about your Xamarin project, such as the interaction with and for Android. 有关使用 iOS 设计器的详细信息，请参阅设计器指南。For more information on using the iOS designer, refer to the Designer guides. 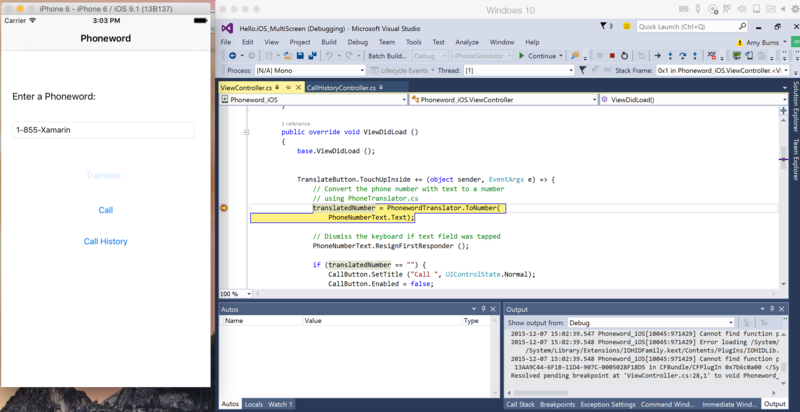 在 Visual Studio 2017 中，统一了 Android 和 iOS 日志面板。In Visual Studio 2017, the Android and iOS log pads are unified. 在工具窗口显示后，用户便可以从“设备”下拉列表中选择物理设备。Once the tool window is shown, the user can select the physical device from the devices dropdown. 选定设备后，日志将自动添加到表中。When a device is selected, logs will automatically be added to the table. 在设备之间切换可停止和启动设备日志记录。Switching between devices will stop and start the device logging. 为了在组合框中显示设备，必须加载 iOS 项目。In order for the devices to appear in the combobox, an iOS project must be loaded. 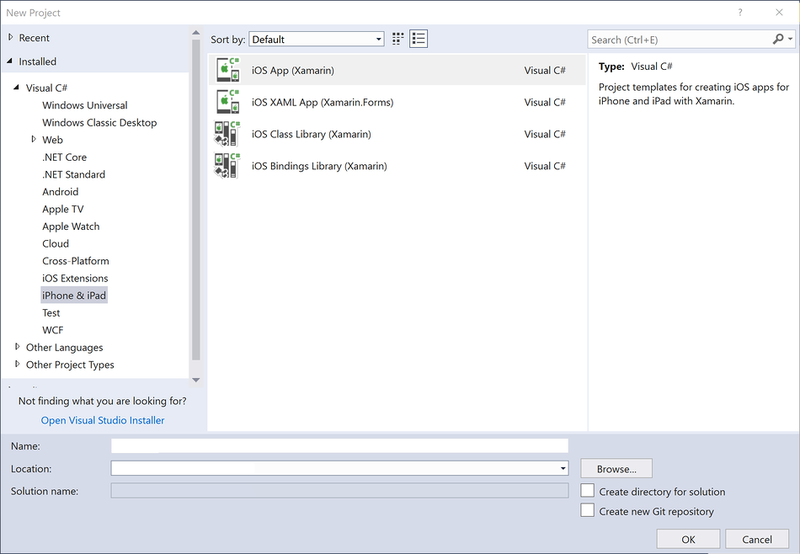 此外对于 iOS，Visual Studio 还必须连接到 Mac 服务器以发现连接到 Mac 的 iOS 设备。Additionally for iOS, Visual Studio must be connected to the Mac Server to discover the iOS devices connected to the Mac. 此工具窗口包括：一个日志条目表、一个用于选择设备的下拉列表、一种清除日志条目的方法、一个搜索框，以及播放/停止/暂停按钮。This tool window provides: a table of log entries, a dropdown for device selection, a way to clear log entries, a search box, and play/stop/pause buttons. 开始调试，并使用模拟器或设备将应用程序导航到断点。Start debugging, and use the simulator or device to navigate your application to a breakpoint. 命中断点时，将突出显示此行并启用 Visual Studio 的正常调试行为：你可以进入、结束或跳出代码，检查局部变量，或使用即时窗口。When a breakpoint is hit, the line will be highlighted and Visual Studio’s normal debugging behavior will be enabled: you can step into, over, or out of the code, examine local variables, or use the Immediate Window. 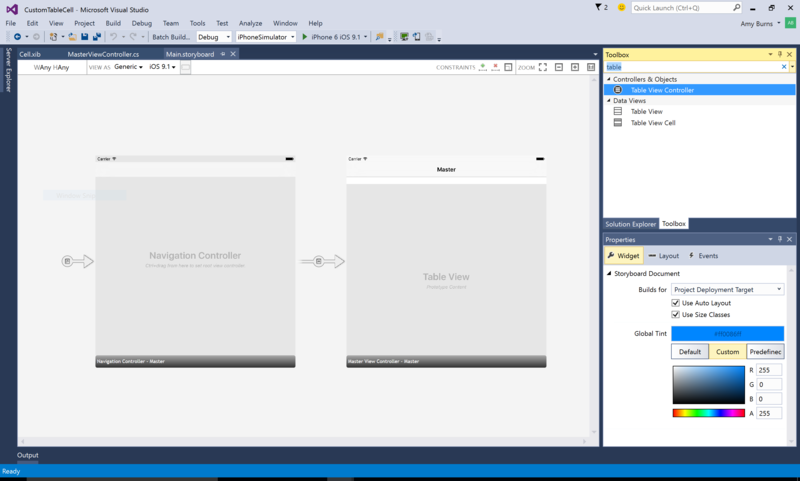 本文介绍如何使用 Xamarin.iOS for Visual Studio。This article described how to use Xamarin iOS for Visual Studio. 列出了可用于从 Visual Studio 中创建、生成和测试 iOS 应用的各种功能，并介绍了如何生成和调试简单的 iOS 应用程序。It listed the various features available for creating, building, and testing an iOS app from within Visual Studio and walked through building and debugging a simple iOS application.